Beauty mogul Sydell Miller closed on a full-floor penthouse at the Bristol in West Palm Beach for $42.6 million. 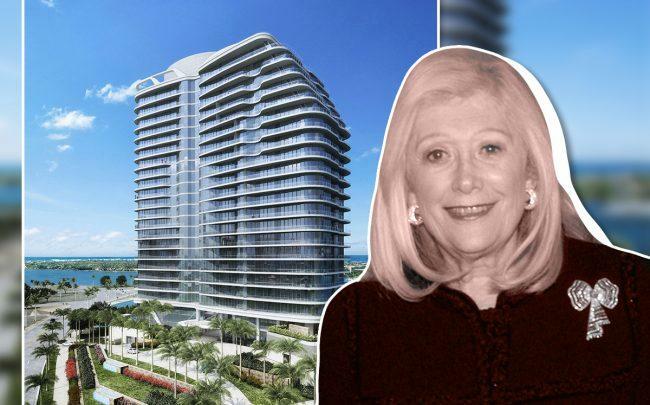 Miller, who with her late husband sold their hair and beauty products line Matrix Essentials to Bristol Myers Squibb in 2005, closed on the entire 24th floor at the luxury condo project, at 1125 South Flagler Drive. Miller was under contract to buy the combined unit last year. Al Adelson and Gene Golub of Chicago-based Golub developed the 25-story, 69-unit luxury condo tower with a $206 million loan from the Blackstone Group. Units range from 3,600 square feet to 14,000 square feet, and are priced from about $5 million to more than $40 million. Douglas Elliman is handling sales and marketing. Buyers at the Bristol include former Wall Street honcho Donald C. Carter, as well as Arthur Loring, former general counsel at Fidelity. Among other philanthropic activities, Miller and her daughters made a $70 million donation to the Cleveland Clinic in 2005, the same year Miller sold her company to the pharmaceutical company Bristol Myers Squibb.